Alex has a unique story, which began when he was born in Lagos, Nigeria, and moved to the United States with his family at age eleven. He is one of seven children and in 2008 he graduated from Alcorn State University. While at Alcorn State, he was twice named Most Valuable Player of the basketball team and served as team captain his senior year. In 2008 Owumi was unclaimed in the NBA draft but Alex still decided to follow his dream of being a professional basketball player overseas. First in France, later in Macedonia, Libya, Egypt, and most recently in England. Eventually he signed with Al-Nasr of Libya, a state-run athletic club privately funded by the family of then-Libyan president Muammar Qaddafi. Alex’s tenure with Al-Nasr was interrupted by the Libyan uprising and resulting civil war. Imprisoned in his Benghazi apartment for more than 2 weeks with no food, phone, Internet, or hope, Alex wondered whether he would make it out of Libya alive. Despite his weakened condition and the dangers lurking in the city, he was able to escape Benghazi and flee the country. Smuggled to a refugee camp in Egypt, he was, much to his surprise, contacted by an Egyptian team seeking his services. And so, in a bizarre, storybook ending, Alex finished the year by helping lead the team to an unlikely league championship, earning Most Valuable Player honors in the process. Through these experiences Alex has found a passion for spreading his message to people all over the world and currently speaks at schools, churches, corporations along with many other places. 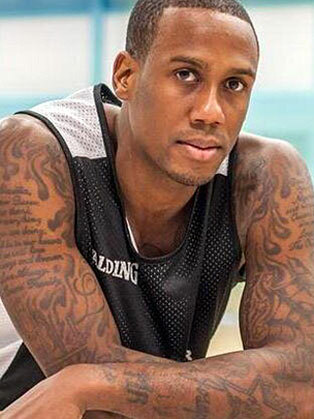 He currently lives in Worcester and spent the 2013 season playing professional basketball in England for the Worcester Wolves of the British Basketball League. Alex is also a full-time writer and in 2013 he published the memoir “Qaddafi’s Point Guard”. During his speaking engagements Alex provides several inspirational and motivation points for his audience. His points leave people with the power to accomplish anything they want in life. Alex speeches guarantee to uplift the mood of individuals and set them in the right direction to achieve any goal they have in mind. More importantly Alex is involved in numerous charities around the world. Some of his main goals while working with these charities are to supply fresh water for many countries in Africa, supply many organizations with fresh hygiene supplies and help provide can goods for many of these charities. His overall goal is to improve the well-being of individuals worldwide.